"The apple of God," an expression of Ancient American Indians, tells us that as far back as 3,000 BCE squash was elevated to the highest status. The belief was that the squash seeds would increase fertility when planted close by, and indeed those with large squash fields did produce large families. With such strong faith in the powers of squash, the early Native Americans made this vegetable an important staple in their diet. Today's inseparable combination of "Thanksgiving and pumpkin" began with the Pilgrims' first Thanksgiving when pumpkins were hollowed out, filled with milk, honey and spices, and then baked. In the modern Thanksgiving celebration, pumpkin maintains its prominent status as the pumpkin pie at the end the meal. Consuming foods rich in beta-cryptoxanthin, an orange-red carotenoid found in highest amounts in pumpkin, corn, papaya, red bell peppers, tangerines, oranges and peaches, may significantly lower one's risk of developing lung cancer. One of the most abundant nutrients in winter squash, beta-carotene, has been shown to have very powerful antioxidant and anti-inflammatory properties. 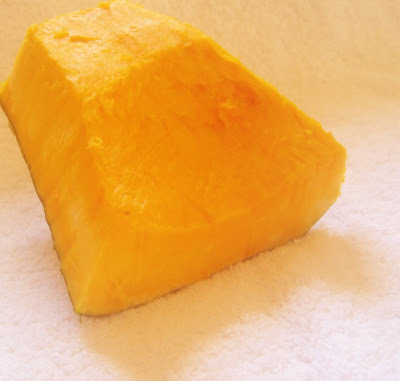 Beta-carotene is able to prevent the oxidation of cholesterol in the body. Beta-carotene's anti-inflammatory effects may help to reduce the severity of conditions like asthma, osteoarthritis, and rheumatoid arthritis, which all involve inflammation. Other nutrients found in winter squash are also useful for a number of different conditions. The potassium in winter squash may help to lower blood pressure, and the vitamin C may be able to reduce the severity of conditions like asthma, osteoarthritis, and rheumatoid arthritis and to prevent the progression of conditions like atherosclerosis and diabetic heart disease. Fiber to Fight Heart Disease and Colon Cancer. Additionally, intake of foods such as winter squash that are rich in carotenoids may be beneficial to blood sugar regulation. Studies have also shown that a good intake of beta-carotene can help to reduce the risk of colon cancer. Back in India, parangikkai/squash has a less sweet taste and thinner skin compared to its US sisters. 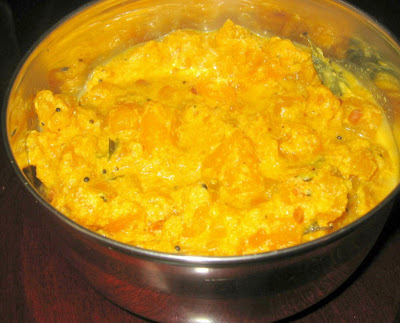 The parangikai pal kootu is my husband’s favorite; My recipe of this kootu is from Athai . I was a little surprised when she mentioned that this kootu recipe had no paruppu/dhal in it. 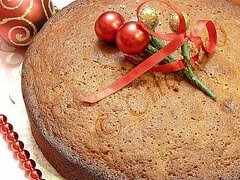 It is a very simple recipe with some sweetness and spice in it. Peel the skin of the parangikkai/squash ( the size in picture) and cut the parangikkai/squash into small cubes to make two cups. Heat the oil in a kadai/pan and add the seasonings in the order given. To the seasoning add the parangikkai/squash pieces. Saute them for few times . Add sambhar powder, salt and perungayam/asafoetida. Add 1/2 a cup of water and cook until soft. Now add the milk and simmer for few minutes until kootu consistency. Finally add the sugar and mix well. Serve with Rice. Usually goes well with Pulli kulambu or kara Kulambu . I 've never tried a kootu with parangikai. I will def try this. Try the kootu and let me know. Very nice Recipe. It was news to knoe that milk is added. I was preparing this koottu with jaggery instead of sugar.Keenly interested to know more recipies.U can also mention equivalent Telugu for some ingredients, e.g., Inguva for Asafotedea. 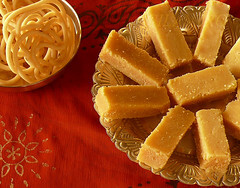 Nice to know the kootu can be prepared with jaggery.